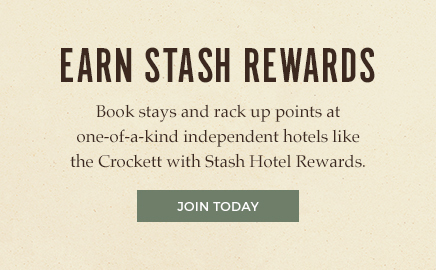 The Crockett is a historic boutique hotel and beloved landmark in the heart of downtown San Antonio. Continuously operating for more than a century, it is named for Davy Crockett, defender of the Alamo and one of history’s favorite frontiersmen. Located just a few steps from the Alamo, the Crockett exudes San Antonio’s flair for independence, romance and family fun. Guests enjoy beautifully renovated guestrooms and suites with free WiFi, an outdoor swimming pool, spa services at the Alamo Plaza Spa, and special amenities for their four-legged traveling companions. Days begin with a complimentary hot breakfast featuring Texas-shaped waffles, breakfast tacos and other treats, and wind down with Happy Hour in Ernie’s Bar, where Texas-crafted beers and spirits take center stage. 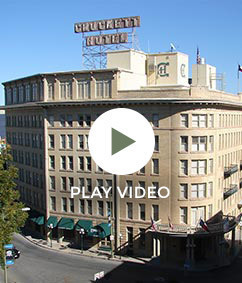 The Crockett offers easy access to San Antonio's most celebrated attractions, including River Walk, a tree-lined oasis stretching 15 miles and featuring shops, restaurants, museums and more. It's one of the reasons Travel + Leisure calls San Antonio's one of the country's most romantic cities.